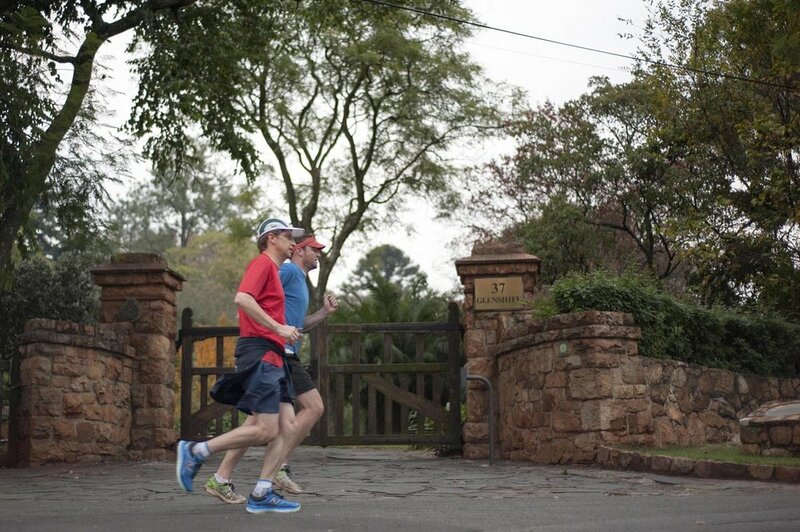 Johannesburg has one of the most vibrant running scenes anywhere on the planet. Between the informal morning running groups found in almost every suburb, the weekly afternoon time trials hosted by clubs across the city, the longer weekend club runs, the organized weekend races, and the countless individuals who take to the road alone or with dog in tow, there are tens of thousands of people who hit the road each week. With its endless leafy suburbs, the city offers many great areas in which to run. However, all runners will have their ‘favourite’ route. This is usually one that offers the right balance of attractive scenery and/or views, doesn’t cross or run alongside too many busy roads, includes a challenging hill or two, and that runs through an area which is deemed to be safe. Having been an active runner in Johannesburg for the most part of 20 years, I certainly have a list of favourites which fulfil these criteria. Below are my top 3. These are some of Johannesburg’s oldest and most beautiful suburbs. Tyrone Avenue in Parkview is an excellent place to start. For a shorter run (6 to 8km) run south up to and across Westcliff Drive, and enter the Westcliff area via the Westcliff stairs. And for a longer option (8 to 12km) start by running around the perimeter of the Zoo Lake on Lower Park Drive and Westwold Way, and then around the Johannesburg Zoo (look out for the cheetah and wild dog through the fence) before crossing Jan Smuts and heading into Westcliff. There are a few circular routes one can run in Westcliff, and all take in magnificent views and some of Johannesburg’s finest heritage houses. Make your way back to Parkview for a well-earned breakfast at one of the fine establishments on Tyrone Avenue. If you feel like joining me on a run, Run With Me Johannesburg offers a regular running tour through the Parkview, Zoo, and Westcliff area, however we can arrange runs through these other areas too. Running amongst Westcliff heritage houses. Emmerentia Dam is one of Johannesburg’s oldest recreational areas. Surrounded by lovely big willow and cypress trees, the dam itself is beautiful, and so is the park that surrounds it. A loop around the dam is a great way to start a run, and from here one can work your way to the top of the Melville Koppie (or hill) on Orange Road. This is a long climb which makes for good training. Head to Zambesi Road for a spectacular view of the CBD, and work your way back to Emmerentia via Hill Road. Routes of between 6 and 8km can be run here. Parkhurst is home to the vibrant, European styled 4th avenue, which is a ‘high street’ with pavement-side restaurant’s, delicatessens, and décor shops – and which is a perfect place to start a run. From here work your way down to 6th avenue and all the way to the end of this road (past 20th street). Here you’ll find a small park with a footbridge that crosses the river and enters Delta Park. Used by a multitude of mountain bikers, runners, walkers, and dog walkers, this is probably the most popular park in Johannesburg. After crossing the bridge run straight up the hill and follow the perimeter of Delta Park on the established pathways. It’s ±2km climb from the river to the top of the park, but the view of both the Sandton and Johannesburg CBD makes it very worthwhile. Follow the pathways back down to the river and to the footbridge, and head back to 4th avenue for a sumptuous breakfast! View from the top of Delta Park. They are 3 of the best places to run in Johannesburg, but there are many more great options in and around the city! Feel free to get in touch if you would to join us for a run.